Robbins became intrigued by Kazakhstan sitting on an aeroplane next to an American from Arkansas on his way there to collect an Internet bride. The only thing most people know about Kazakhstan is that it is homeland to Borat – and he isn’t even real. Actually this vast place – the last unknown inhabited country in the world – is far more surprising and entertaining. For one thing, it is as varied as Europe, combining stupendous wealth, grinding poverty, exotic traditions and a mad dash for modernity. 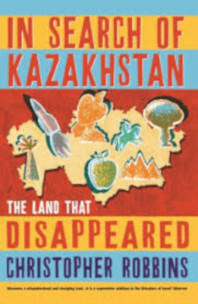 Crisscrossing a vanished land, Christopher Robbins finds Eminem by a shrinking Aral Sea, goes eagle-hunting, visits the scene of Dostoyevsky’s doomed first love, takes up residence beside one-time neighbour Leon Trotsky and visits some of the most beautiful, unspoilt places on earth. First published by Profile (UK) in 2008.